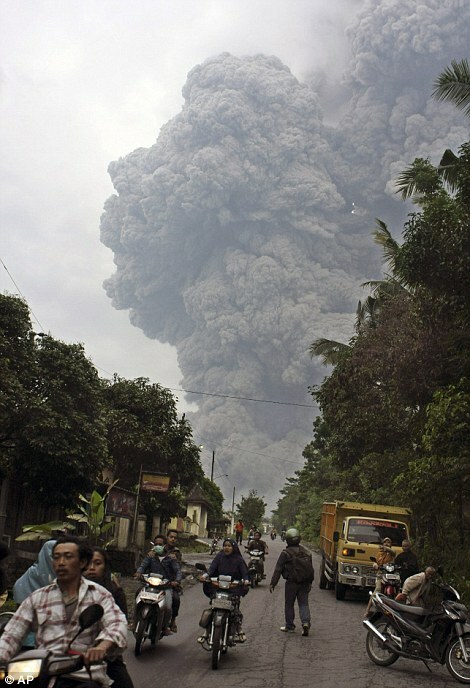 And yet another Indonesian volcano erupts! 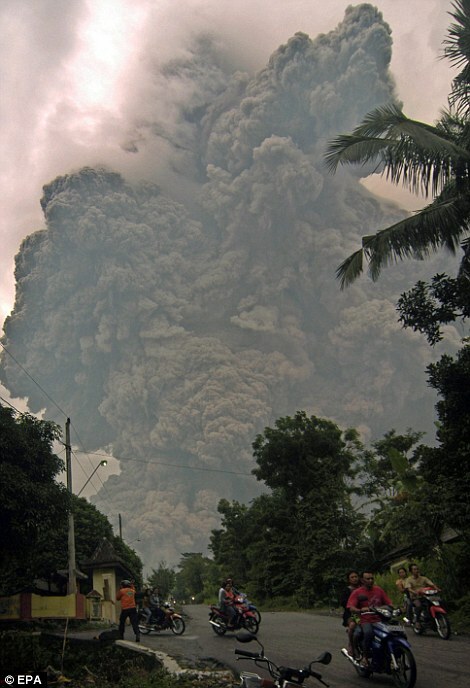 Jakarta, Indonesia (CNN) -- The Mount Merapi volcano in Indonesia erupted at least three times Tuesday, forcing thousands of nearby residents to flee. Mount Merapi, which looms on the horizon north of the major city of Yogyakarta, is one of Indonesia's most active volcanoes and lies in one of the world's most densely populated areas. The volcano has a summit elevation of nearly 10,000 feet (3,000 meters). MOUNT MERAPI, Indonesia – Searing gas and molten lava poured from Indonesia's deadly volcano in an explosion three times as powerful as last week's devastating blast, chasing people from villages and emergency shelters along its slopes. 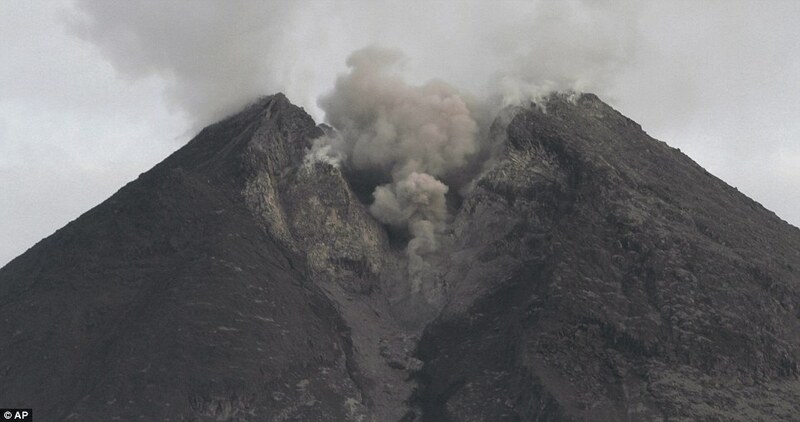 After more than a week of continual eruptions, and warnings that pressure inside Mount Merapi may still be building, the province warned Wednesday it was running out of money to help more than 70,000 people forced from their homes. No new casualties were reported after Wednesday's fiery explosion — which followed just before dawn Thursday by another booming tremor and ash cloud. "This is an extraordinary eruption," said Surono, a state volcanologist who had earlier said energy building up behind a magma dome in the crater appeared to be easing. He said the blast, which dusted cars, trees and roads in towns up to 80 miles (130 kilometers) away in gray ash, had triple the force of the first eruption on Oct. 26. "We have no idea what's happening," he said, as he watched the bobbing needle of a seismograph machine. "It looks like we may be entering an even worse stage now." MOUNT MERAPI, Indonesia — Searing gas avalanched down an Indonesian volcano with a thunderous roar, torching houses and trees and incinerating villagers as they fled Mount Merapi's worst eruption in a century. Dozens of bodies found Friday raised the death toll to 122. The injured — with clothes, blankets and even mattresses fused to their skin by the 1,400-degree Fahrenheit heat — were carried away on stretchers following the first big explosion just before midnight. Soldiers joined rescue operations in hardest-hit Bronggang, a village nine miles from the crater, pulling at least 78 bodies from homes and streets blanketed by ash up to one-foot deep. THE MERAPI volcano, currently exploding more forcefully every day in Indonesia, is located on the Sundra Arc, one of the planet’s most complex and dangerous geological areas. This is where two large plates of the earth’s crust, the Australian and Indian plates, are rapidly plunging down below the mini Burma plate to create the world’s deepest and most powerful earthquakes and the world’s largest and most dangerous volcanoes. Some scientists fear that something catastrophic may be brewing beneath the Sundra Arc. The world’s three most deadly tectonic events in recorded history all occurred in this arc of volcanic islands that include Sumatra and Java. Tambora, the largest volcano ever recorded in human history, erupted in 1815. Records were not very good at the time, but at least 100,000 people died in the supervolcano. In 1831, the world’s second largest recorded volcano blew 4 cubic miles of material off the top of Krakatoa Mountain and into the Indian Ocean, where it created a 150-foot high tsunami that killed 34,000 people. This disaster was more fully recorded because the telegraph had just been invented. And then there was the tsunami that occurred the day after Christmas in 2004. It killed 150,000 people and left millions more homeless. The present cycle of tectonic activity probably started right around that time in 2004 when the Indian plate thrust rapidly below the Burma plate, initiating one of the deepest and most powerful earthquakes ever recorded. The magma emerging out of Merapi is not liquid lava like what we see flowing out of Hawaiian volcanoes. This material is more like half-melted rock that is extruded out of the volcano like toothpaste being squeezed out of a tube. But the magma also contains gases under pressure that are causing the eruptions, rockfalls of flaming hot boulders, and pyroclastic flows: shock waves of heated gas and ash that on Nov. 5 engulfed an entire village in a “safe’’ area nine miles from the base of the volcano. These pyroclastic flows of ash and hot gas are what seared people’s lungs on Pompeii. They can also travel unseen across half a mile of water to incinerate ships at sea as they did when Mount Pelee erupted off the island of Martinique in 1902. 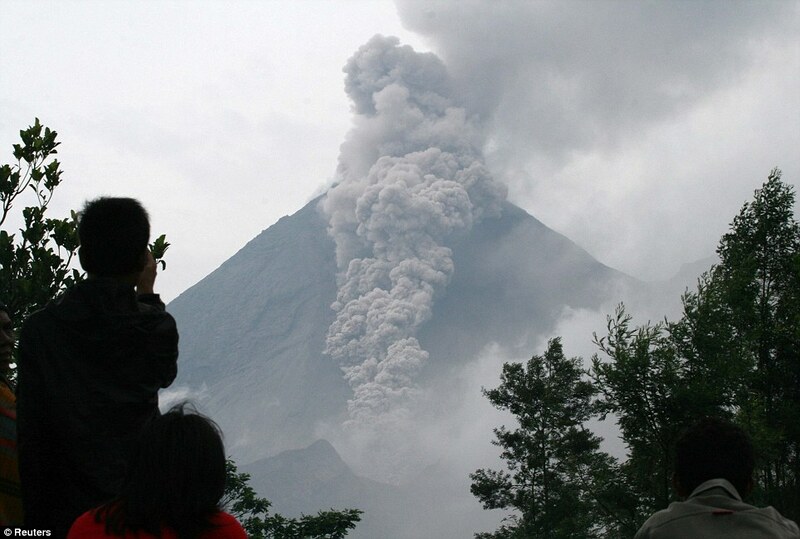 But Merapi is not the only volcano now active on the Sundra Arc. Within the past few weeks there have been many more deep earthquakes and 20 other volcanoes have also become active. Indonesia is also home to the Lake Toba supervolcano, believed to be the largest explosive eruption to have occurred on our planet during the past 25 million years.